On October 21, on the anniversary of the death of Horatio Nelson, and his victory at Trafalgar, I and many others will be toasting The Immortal Memory. There are legions of books on Nelson and his life and times – and I did wonder what more could be written about this subject. But Nelson’s Band of Brothers is a valuable contribution to Nelsonian scholarship as it contains new information – and overturns a few myths. The book extends the work undertaken by the late Colin White for The Trafalgar Captains, published in 2005. The biographies of some eighty officers that make up this new volume range from lieutenants in command of gunboats at the battle of Copenhagen through captains of line-of-battle-ships at the Nile and at Trafalgar, to admirals in command of squadrons in his fleets. Nelson possessed a genius for naval warfare and deservedly remains a towering figure of his age. But he did not win his victories alone. He gathered round him a succession of officers to put his bidding into action. They were the captains of his ships and he called them his Band of Brothers. Some characters are generally well known – Hardy, Collingwood and Troubridge etc. – but many are not household names. For the first time all Nelson’s captains are chronicled in one book, their social origins, their characters and their achievements not only under Nelson’s command but also in their lives and service beyond. Nelson’s Band of Brothers, ably edited by Peter Hore, is organised into three main sections: The Battle of the Nile, Copenhagen and the Baltic, and The Campaign at Trafalgar. As well there are several additional sections and an extensive bibliography. The Royal Navy in Nelson’s time was varied and international in composition, as is attested by the chapter ‘North Americans in Nelson’s Navy.’ It points out that at the height of the wars with France roughly two percent of the British fleet’s personnel consisted of North Americans. One of the features of the book that I found particularly interesting is the photographs of all the monuments and memorials to Nelson’s captains with descriptions and transcriptions of epitaphs, and directions to enable people to find them. A useful map of the memorials around the UK at the beginning of the book provides an overview of their locations. 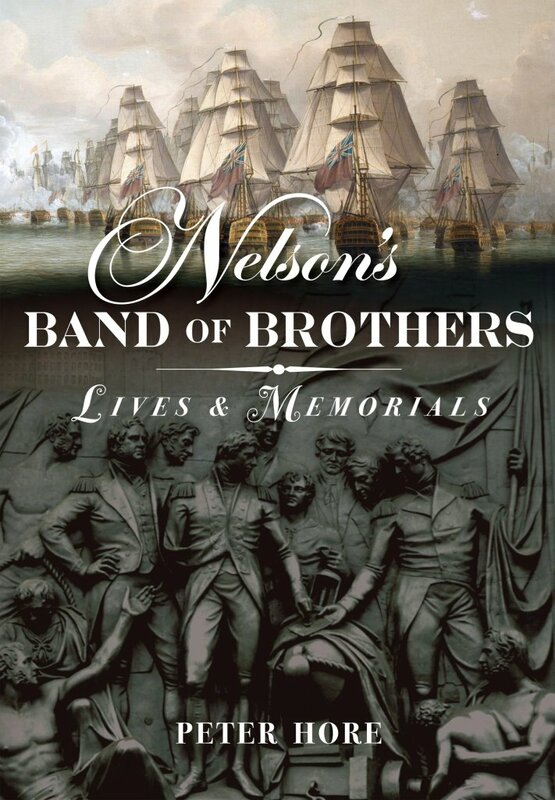 Nelson’s Band of Brothers is a handsome tribute to both Nelson himself and all the officers, eclectic and diverse as they were, who commanded ships or squadrons of the fleets which fought under his tactical control at his three great sea battles. ← TYGER sails forth in style! Captain George Duff, from my family line, skippered HMS Mars, a 64 ship of the line at Trafalgar. Lord Nelson instructed him to lead the close in shore squadron to keep close contact with Cadiz and inform Nelson as soon as possible when the French and Spanish came out of the harbour. HMS Mars was the second vessel in Collingwood ‘s line when they engaged the main enemy fleet. His son, a 13 yr. old Mid-shipman served on the same vessel and he survived the battle and later rose to rank of Vice Admiral. There is a marble plaque to George Duff, set in the floor of St. Pauls Cathedral , close to Lord Nelson’s tomb. Miscellany at a hospital. J hope whoever found it enjoys it! Where can I get another since Amazon and the like appear unable to supply one!